This perfume is the allegory of a mysterious and fascinating tree, from its roots to its branches. The top notes include the bright, sparkling and fresh citrus, the Italian Bergamot and the Tangerine of Calabria, and a touch of Cardamom. The Majestic Indian Sandalwood is the centre of this noble and beautiful composition. Its dry side is highlighted by an original Mediterranean wood chord made of Cedar and Cypress making us travel to a dense forest. 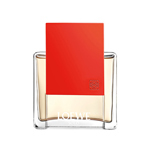 The Vetiver accompanied by Carrot Seeds brings freshness, originality and masculinity to the heart. The base notes of the composition, as the base of this imposing tree, smell of damp earth from which come out the spring notes of Patchouli. The creamy and sensual texture is driven by the velvety White Musk, the luxurious Ambrette and the iridescent facet of the Violet. A simple and elegant design, without artifices, where the naturalness lies in every element: an organic woody cap and sunrise colours.